The electric pickup truck vying to be first to the commercial market has quite a pulse. 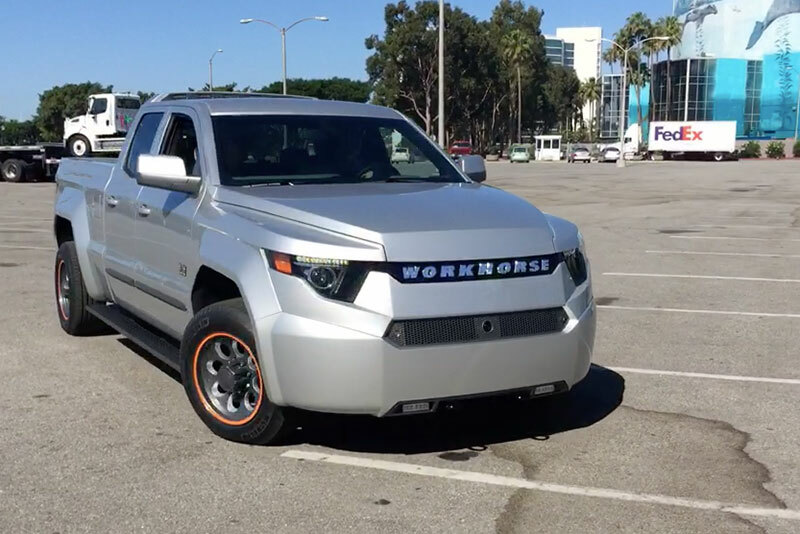 Workhorse Group Inc. invited Trucks.com to test the abilities of its pre-production W-15 work truck ahead of its debut at the Advanced Clean Transportation Expo in Long Beach, Calif.
During the short drive, the electric pickup delivered on its promise of impressive power and the utility of a true work truck. The truck can blast ahead in near silence, quickly building to freeway speeds as it goes from zero to 60 mph in 5.5 seconds. The only sounds are the faint whine of the electric motor and the creaks and clinks of a full-size pickup truck chassis twisting under acceleration. Yet acceleration is not visceral, like that of the Tesla Model S. Nor is it as peppy as the lightweight Chevrolet Bolt’s. The W-15 may use a similar powertrain to those vehicles, but it is not designed for car-like performance. Even with its lightweight construction employing carbon-fiber body panels, the W-15 carries a heftiness that differentiates it from other electric vehicles. Trucks.com took the first working version of the W-15 for a short test drive in downtown Long Beach Monday. The truck is more than the static concept vehicle manufacturers display at auto shows but not quite a full prototype. The test vehicle serves as a proof of concept the Loveland, Ohio, company can use to show potential clients and win orders. Already, companies such as Duke Energy, Ryder System Inc. and municipalities are signing up to put the truck in their fleets. 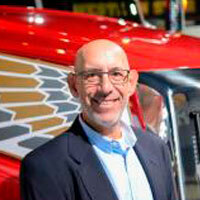 The truck is sure to evolve between now and production, said Stephen Burns, chief executive of Workhorse. Brushed aluminum handles on the inside of the doors may not be available; and cables that hold the liftgate will eventually be replaced with pneumatic struts. Although the entire body of the test W-15 shown is made of carbon fiber to reduce the vehicle’s weight, production models will use composite plastic body panels with some carbon components. The vehicle took Workhorse about nine months to build – a quick turnaround for such an ambitious project. The W-15 is powered by Panasonic lithium-ion battery cells lining the floor of the truck, which give the truck the lowest center of gravity of any production full-size pickup, Burns said. The truck produces an estimated 450 horsepower. It delivers power with smooth consistency, better suited for the reliability needed under towing and hauling. Workhorse can potentially tailor the power delivery based on customer preference, Burns said. Independent coil suspension on all four wheels provides a smoother ride than the leaf springs employed in most full-size pickups. The W-15 is capable of 80 miles of all-electric range. It features a three-cylinder “range extender” engine under the hood that generates power for the electric motors when the batteries run low. The electric motor and extender lie under the hood, beneath a plastic covering adorned with the bright yellow Workhorse logo. A small compartment there can be used for storing cables, or a worksite hardhat or two. A second electric motor is located at the back of the truck and powers the rear axle. Braking is one area in which the W-15 is expected to change before it reaches production. During the test drive, the brake pedal needed significant pressure to slow the truck. Unlike some electric vehicles, the W-15 does not immediately decelerate under coasting in order to regenerate power for the electric batteries. Burns said Workhorse could make the brakes more aggressive in the future. Workhorse may explore ways to allow the driver to adjust the level of regeneration. Other electric-powered vehicles like the Cadillac ELR and Audi A3 Sportback e-tron use paddles to select regenerative braking settings. Fit and finish are a strong point for a vehicle so early in the production cycle. Leatherette seats are comfortable and supportive and outlined with orange accent stitching. Center storage offers generous space, and its lid opens into smaller compartments for phones, tablets or notepads. The center-mounted transmission knob easily clicks between selections. A digital information display faces the driver and provides information such as battery life and range. Providing a clear and crisp picture, the large touch screen controls interior functions, including navigation and air conditioning. Burns said Workhorse made sure to use a screen that can be operated with work gloves. Unique features highlight the truck’s electric DNA. An orange start button on the left spoke of the steering wheel brings the W-15 to life without fanfare. The front “grille” is made of metalized black plastic that is 20-percent clear, allowing ambient light behind the Workhorse lettering to create a glowing effect at night. LED lighting is present in the headlamp projectors and taillights, accent lights on the bottom of the front fascia, and hazard lights mounted to the rear of the roof. The W-15 also has three “fuel” doors: one for electric charging; one for topping off the gasoline extender; and one for a power export that can provide electricity for on-site tools or even home appliances. Workhorse will continue to tweak the W-15 in the coming months and plans to produce about 30 prototypes to be used for crash testing and other evaluation. The company currently has 5,000 non-binding orders for the W-15, and has slated production to begin in the fourth quarter of 2018. 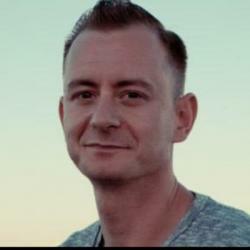 It invited several potential customers to the Alternative Clean Transportation expo in Long Beach this week with hopes of securing more fleet orders. Not sure I understand this quote about the 0-60 in 6.3 seconds accelerating Bolt. Is peppy a third measure of speed adding to “fast” and “quick” ? Thanks, Joel. It’s a great question. The short answer is that the Workhorse W-15 prototype, even with carbon fiber body panels, is roughly twice as heavy as the Chevrolet Bolt. All that weight creates a different sensation of speed. It’s more of a freight train than a go-kart; building momentum instead of quick bursts. Still wildly impressive, of course. Just different. I don’t anderstand the brake will be agressive? They’re saying that it’s likely that more brake will be applied with less pedal pressure in the production model than in the prototype available today. Modern vehicles aren’t directly commuting pedal pressure to brake pressure anyway, so this is just software. Personally, I hope they do make this fully configurable as in the Model S and many mainstream hybrids. For my taste, I like very heavy regen on coast. If I want to coast as far as I can w/o regen, I’m happy keeping the “gas” pedal 1/8 down. One pedal driving is great once you get used to it. I’m interested to see when these will hit the consumer market. $50k+ is a lot for a non-fleet vehicle, but I’m doing my grocery getting in a Superduty today. 99% of my driving would be within the projected 80-mile all-electric range. I may not be your average American truck buyer, but I’d very likely shell out for one of these if it came with a rock solid warranty to prevent first-gen problems from turning it into very expensive lawn art. You should contact Workhorse or Ryder, which will distribute the vehicle.